Venus became the automatic darling of Serena’s fans and tennis lovers who were naturally sentimental about the elder of the Williams sisters winning what could have possibly been her last Grand Slam title. Alas it wasn’t meant to be. Garbine Muguruza comprehensively defeated Venus in straight sets during last Saturday’s Wimbledon Women’s Final. It wasn’t the script many expected to play out, but it was the reality at the end of a game that turned out to be pretty one-sided. This piece is not about Venus’ prowess as a veteran of the game of tennis. It is incontrovertible that she remains one of the greatest tennis players of all time even if she never hits another ball. It’s also not an attempt to drum up sympathy for her in the light of the fact that she has had to make do with being second favourite to her younger sibling for a while now. Sometimes, it’s not about winning literally in a specific contest; and Venus has won many of them, (she remains the first African-American to be world number one, and also holds the record for the highest number of gold medal wins at the Olympics along with her sister), the bigger picture for any thinking person should be winning in the game of life, a feat I believe Venus has accomplished, even though she’s only 37 years old. Not many would be magnanimous enough to consistently support and prefer another to themselves, even a younger sibling. But time and again, Venus has demonstrated that she’s the quintessential older sister. Her grace and composure are qualities to not just admire, but imbibe. It must be tough for her. It must be tough. Having to contend with an autoimmune disease that ensured she never really hit the heights she had the potential to reach. Knowing that she tires out quickly even though she fights as hard as possible to defy her health condition; must be frustrating. Yet, she displays a rare big-heartedness whenever she talks about her sister, content to downplay her own achievements despite once being the alpha female among the two. There are no prices for guessing that Venus will likely never upstage her little sister in the world of tennis. Age is not on her side, and frankly, she’s past her prime. But why she may not be the better tennis player, she is unarguably the more level-headed of the two. With a body language that never betrays all the disappointments she has had to endure in her long career and having to play second fiddle to her little sister, Venus has demonstrated at any opportunity she’s had that she’s always willing to see her sister shine in her place. And while it may be easy to assume it’s what siblings should do for each other, we must not forget that sibling rivalry is real and can be a phenomenon that lasts a lifetime. 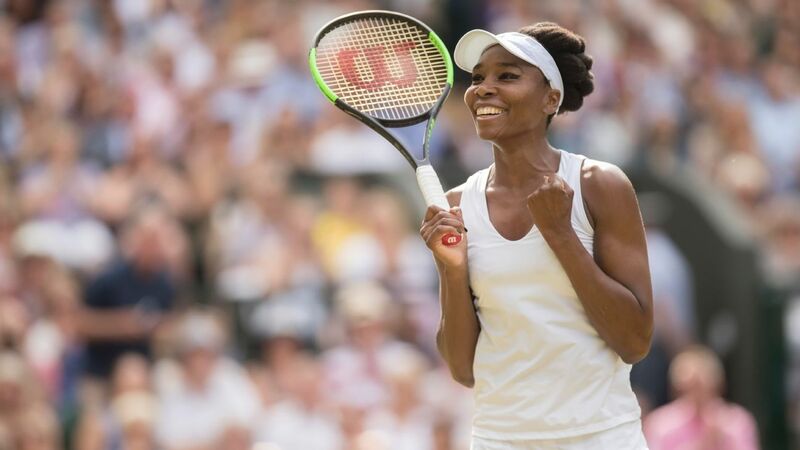 The Venus Williams Masterclass is not one in tennis, (Serena might be better suited to teach us that one), rather, it’s a lesson in class, generosity of spirit, magnanimity in victory and grace in defeat. Last Saturday’s loss to Muguruza, the Spaniard who’s fourteen years younger and grew up watching Venus play came as a big blow, but beyond the obvious disappointment was a promise to be back. I am a firm believer in seeing beyond the usual in everything I do. Whether I am driving, involved in a conversation or watching TV, I’m always quick to pick nuances, and general life tips from that activity. Seeing a game of tennis is no different. Venus’s response to losing out on the golden chance to rewrite the record books at Wimbledon, and overall conduct since she began her professional career had me reflecting. Venus has nothing to prove again. Her pedigree is unquestionable. She will always represent a transcendent, ageless champion who exemplifies dignified grace in the face of obstacles. Little wonder why she was also named Starr. As her career mortality looms closer, it makes plenty of sense to take the time to appreciate this epic tennis player and all round fantastic human. Hmmmm… Life Lessons frm Venus! One we all shld learn from. Thx also for doing what u do Lolo! And thank you for always supporting too. Well done lolosthoughts, your write-ups are inspiring. May God continue to bless your endeavors. Yayyy! Look who’s here! Thanks a bunch sis. Just like I thought Roger Federer couldn’t be at the top of his game anymore, I held the same belief for Venus Williams, but seeing her reach two grand slam finals at her age after everything she’s been through, she’s definitely still got something to offer. You can say that again. Thanks.